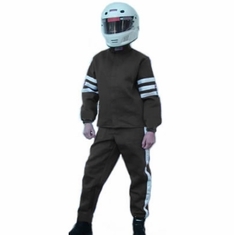 RJS standard style quarter midget and junior dragster racing suit is a solid color racing suit with stripes on arms and down side of legs. (Check with your child / kids racing association for proper fire rating and suit layer requirements). WE STRONGLY RECOMMEND THAT YOU ORDER EARLY TO AVOID THE RACING SEASON RUSH! 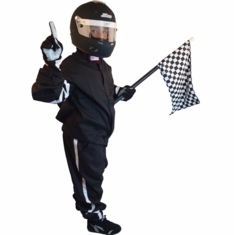 These STANDARD kids race suits are SFI Approved. In Stock orders ship within Same Day - 2 business days. Easily Order Single Layer, Multi-Layer, SFI-1, SFI-5 Suits Online Below! 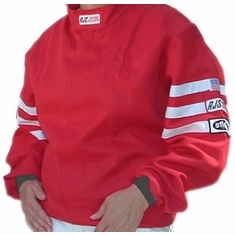 A Custom Fit form Should be filled out for Child racing suit orders to ensure proper fit. 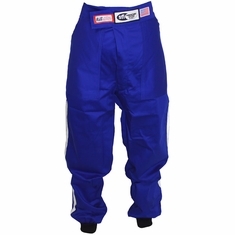 For your Child racing suit order click on Custom Fit if you wish to order a Custom Fit racing suit or if you are not sure about your size, click on Custom Fit so we can determine your standard size. Click on Custom Style to Design Your Own Online where you can choose your individual stripe colors etc. or to choose from 9 ready made custom styles. 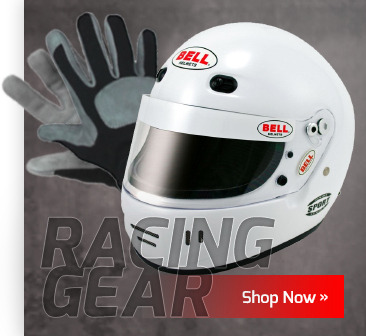 Otherwise, just pick a standard size and color from the drop down size and color windows under the type of racing suit that you would like to buy.